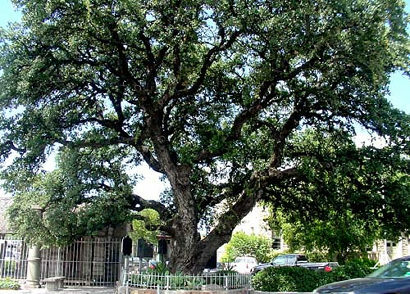 Martin V. Fleming and The Fleming Oak of Comanche, Texas. 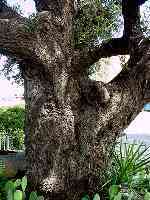 Tradition and history surround the Fleming Oak. William W. Fleming and his sixteen year old son, Martin V. reputedly camped near the tree as they passed through the area about 1854 freighting on the Ft. Gates/ Ft. Phantom Hill Road established to serve the short-lived military post located above modern Abilene. It was a prospecting trip, of sorts, before the town of Comanche was established. The Fleming family was living in Williamson County in 1850 at Georgetown but they relocated about 1854 to a home near the site of modern Killeen. Martin V. Fleming apparently visited in Comanche again in the late 1850s as he returned to his Bell County home from a deer hunt. He learned of the Civil War while in Comanche and joined Co. G., First Texas Cavalry under Col. Thomas C. Frost in May of 1861 with a group of area men who mustered in at that time. Mart Fleming, wounded twice, was discharged on disability in June of 1863 but he apparently did not return directly to Comanche. He lived briefly in Mexico after the Civil War but settled in Brenham about 1866. Some relatives lived in Washington County and there he was married to his second wife, whom he brought to Comanche in 1872. Uncle Mart, as he was affectionately known, was a stockman and a farmer with business interests in Comanche through the years. He is best remembered for his meat market located on the south side of Comanche's square opposite the Fleming Oak and next to the original Comanche National Bank building. The fa�ade at the market site is being restored as part of Comanche's Main Street program. A beloved Comanche tradition arises from the city's effort to remove all the old trees from the square about 1911. The often-told tale recounts the story of Mart Fleming defending the tree with his shotgun and threatening anyone who would take an axe to it. A similar story survives about an event in 1919 when Uncle Mart, again, protected the tree from a crew paving the square. In an interview in 1921, Fleming says he did not mention his shotgun but told those who threatened the tree that he would use his "No. 10's" on them, a reference to his boot size rather than a gun. Fleming reported that some rough words were needed but workmen laid down their tools. The shotgun defense legend has been told and retold, spelled out on an historical marker beneath the tree, and is an entrenched piece of local folklore. Another long established Comanche tradition is decorating the Fleming Oak with lights at Christmas time. Uncle Mart died in 1928 and is buried in Comanche with his only child, Camille, who remained single and lived at home. Uncle Mart, thrice married, is reputed to have helped rear several orphans and his family included step children as well. A colorful figure, tall, lean, and pictured late in life with a white beard, Uncle Mart continues to remind one of Comanche's past. The tree he saved is treasured.